Poly Moss Floor Squeegee 22" or 30"
When controlling spills, choose the Poly Moss Floor Squeegees for help. An indispensable liquid control tool! 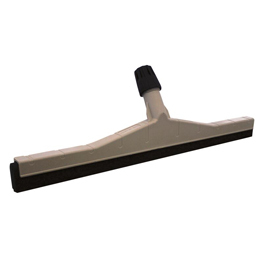 Moss Rubber Floor Squeegee w/ Plastic Frame Black Blade has excellent elasticity, and the closed cells do not absorb liquid. The double blades work equally well on smooth or uneven surfaces the 1st blade removes the bulk of the liquid, and the 2nd blade follows the surface contour removing all remaining liquid. The surface is left dry to the touch. Tightly Connects to the handle-up to 1"- with a Compression Nut. Item: Poly Moss Floor Squeegee 22" or 30"